Sweden, a Nordic Country on the Scandinavian Peninsula in Northern Europe bordered by Norway, Finland, Baltic Sea, Gulf of Bothnia, Kattegat, Skagerrak, and Denmark through a bridge-tunnel has a total land area of 173,745 square miles and a population of around 9.4 million. Sweden is a beautiful country with four distinct seasons. The Gulf Stream keeps it warmer than other places with similar latitude. Sweden is known all over the world as the country that awards the prestigious Nobel Prizes. It is a highly developed country whose citizens enjoy the highest standard of living. Its industrial and technological strength, and its commitment to research and development has made it a world leader in medical, pharmaceutical, scientific, industrial, and engineering sectors. It is an export-oriented mixed economy. The main sectors of its economy are engineering, automotive, and pharmaceutical industry and its resources are based on timber, hydro-power and mineral deposits. Its second place ranking in Global Competitiveness is a salute to its highly efficient private sector. Its environmental policy is also top-notch. The best time to visit Sweden is during summer (Jun-Aug) when the midnight sun can be enjoyed to its fullest. For those wishing to catch the Northern Lights, winter is the time to visit Sweden. Wildflowers dot the countryside in spring. None can challenge Sweden for she expresses herself well through her landscape. Sweden has plenty of national forests and parks – 65% of Sweden is covered with forests. Her popular cities are Stockholm, Goteborg, Malmo, Uppsala, Lund and Kalmar and popular water-bodies are Storsjon, and Lake Siljan. Its mines at Kiruna, and Dalarna are well worth the time invested. Meatballs, mashed potatoes, lingonberry jam, and gravy is a typical Swedish meal. Crayfish, pickled herring, pitepalt dumpling, pancakes, and marzipan are all essential Swedish dishes. DK Eyewitness Travel Guide: Sweden 978-0756669355 $16 A 120-page traveler’s introduction and a survival guide followed by region-wise coverage spanning another 200-odd pages. Stockholm Eyewitness Travel Guides 978-0756660512 $14 Good photographs and maps. Detailed coverage with chapters on Gamla Stan, City Center, Blasieholmen, Skeppsholmen, Djurgarden, and Sodermalm. Lacks Budget listings – Internet research is the best option there. Sweden Michelin Map 978-2067126893 $7 1:1,200,000 Scale. Includes City maps of Stockholm, Gothenburg, and Malmo along with driving times and distances. The first stamps of Sweden were a set of five stamps released in 1855 in the Coat of Arms theme in different single-colors and denominations. The set (Scott #1 to #5) is very rare and catalogs for around $28K mint and around $6K used. A variety in the same theme followed during the period from 1858 to 1861. That set (Scott #6 to #12) catalogs for around $2300 mint and around $400 used. Sweden released a set of eleven stamps between 1872 and 1877 showing Numerals and Coat of Arms. The set (Scott #17 to #27) is rare and sought after and catalogs for around $5800 mint and $440 used. A variety of the same set with a subset of the denominations was issued between 1877 and 1879 and that set (Scott #28 to #36 and #38) catalogs for around $2000 mint and around $65 used. Imperforate pairs of some of these issues are known to exist and each such pair catalogs for around $750. Due to slow industrialization and population growth, over one million Swedes moved to the United States. 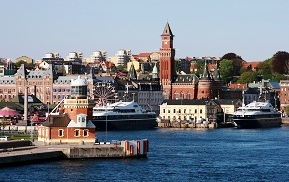 Starting around 1870, Sweden began developing the industrialized economy that exists today. Sweden released a set of fourteen stamps between 1891 and 1904 showing Numerals and head portraits of King Oscar II in two different designs. The set (Scott #52 to #65) catalogs for around $440 mint and around $10 used. Imperforate pairs of issues of this set are also available and each such pair catalog upwards of $100. Sweden issued a long set of nineteen stamps between 1920 and 1934 showing the Crown and Post Horn in two different designs. The set (Scott #145 to #163) catalogs for around $425 mint and around $145 used. A set of fifteen stamps released on February 20, 1936 to mark the 300th anniversary of the Swedish Postal Service. The set (Scott #248 to #262) catalogs for around $300 MNH and around $30 used. The designs show Chancellor Axel Oxenstierna, post runner, mounted courier, old sailing packet, mail paddle steamship, mail coach, 1855 stamp model, mail train, Postmaster General A.W. Roos, mail truck and trailer, modern Swedish liner, and Junkers plane with pontoons. A set of three stamps released on June 1, 1957 to mark the fiftieth anniversary of the Swedish Life Saving Society. The set (Scott #499 to #501) catalogs for around $10 MNH and around $3 used. The design shows a ship in distress along with a lifeboat. A set of eight stamps released on September 28, 1970 in the Swedish Trade and Industry theme. The set (Scott #861 to #868) catalogs for around $13 MNH and a little more for used. The designs show timber industry, shipping industry, heavy industry showing propeller, hydroelectric power showing dam and diesel, mining showing freight train and mine, and technical research. Sweden has an export-oriented mixed economy with a flat income distribution. Its Gini coefficient is the lowest of any country. A set of eight stamps released between 1981 and 1984 showing King Carl XVI Gustaf and Queen Silvia. The set (Scott #1366 to #1373) catalogs for around $7 MNH and around $4 for used. A set of ten stamps released on May 15, 1990 in the Apiculture theme. The set (Scott #1819 to #1828) catalogs for around $20 MNH and around $4 for used The designs show worker bee collecting nectar, bee and bilberry flower, worker bee, apiary hive, two bees in honeycomb, drone, queen bee, swarm hanging from tree, beekeeper, and honey. A set of five stamps released on March 19, 1998 showing Public Buildings. The set (Scott #2269 to #2273) catalogs for around $7 MNH and around $3 for used. The designs show Fire Station on Gavle, Shoe Shop of Askersund, Fish Halls of Gothenburg, Rodalvarm Cinema of Halmstad, and Town Hotel of Eksjo. The first coins of Sweden were Dalers (1 Daler = 4 Mark, 32 Ore, or 192 Penningar) introduced in 1534. The denomination was renamed as Riksdaler in 1604. Square pieces of copper weighing up to 20 kilograms (10 Daler) were issued. Sweden was the first country in Europe to issue paper money when it was introduced as an emergency measue between 1661 and 1667. A new currency system (1 Riksdaler = 48 Skilling, 1 Skilling = 16 Runstycken) was introduced in 1777. In the modern era, Reform Coinage (100 Ore = 1 Riksdaler Riksmynt, 4 Riksdaler Riksmynt = 1 Riksmynt = 1 Riksdaler Specie) debut in 1856 with the introduction of Bronze Half Ores. The first issue with low mintage (26K) is valuable and catalogs for around $100 in VF. A further reform in 1873 (100 Ore = 1 Riksdaler Riksmynt = 1 Krona) established the present coinage of Sweden. The first coin was a Bronze Ore with high mintage (over 2M) but still catalogs in the $90 range for UNC. The first gold coins were released in 1881 with the release of 0.0648 troy ounce 5 Kronor coin issue of 1881. Early gold coins of Sweden command a good premium over bullion value. Coins $1 and up Ores from the 1980s onward in BU starts around $1. 19th century Bronze Ores in XF+, 19th century and early 20th century Silver Coins in VF+, etc start around $15. 16th century Sigismunds and other rare issues from the period, Recent Commemorative Silver Proofs, etc start around $50. 18th Century and prior date Silver Coins in VF+, 19th century and early 20th century gold coins in UNC, etc go well into the 100s. 16th century Square Marks, Plate Money Dalers from the 18th century, etc go well into the 100s and 1000s. Paper Money $3 and up Common Kroners in UNC starts around $3. UNC Kronors from the 1960s and 1970s starts around $10. Large Notes from the 1950s, High Value UNCs, Rare Replacements, etc start around $50. Rare Dates, Large UNC Notes from the 1960s, Rare Specimen Notes, etc go well into the 100s and 1000s. Swedish Dala horse, felt elks, glassware, ceramic craft, and art are typical souvenirs of Sweden. Pottery and Glass $10 and up Konstglas Glass Figurines, Black Amethyst Painted Glass Vases, etc start around $10. Kosta Crystal Art Figures, Boda Foot Vases, Hovmantorp Green Grass Fruit Berry Bowls etc start around $40. Gustuvsberg Vases, Gullaskruf Paperweights etc go into the 100s. Art $5 and up 19th century art prints start around $5. Antique Print Mugs, Stone Jars etc start around $30. Original works by Joesph Karl, Bengt Lindstrom, Jonny Forsstrom etc go into the 100s. Antiques $5 and up 19th century maps start around $5. Vintage Teak Wood Herring Container Sills, 19th century Snus-Stash Boxes, etc start around $25. 18th century and older maps, Rolakan Wall Hangings, 19th century Swedish Wood Trough and Grinder Wheel, etc start around $100. Antique Scandinavian Tapestry Rugs start in the $1000 range. Miscellaneous Collectibles $1 and up Soccer Cards, Post Cards, etc start around $1. Reijmyre Crystal Figurines, Rorstrand Porcelain National Costume Plates, etc start around $20. Mats Jonasson Blown Crystal Paperweights, Vintage Kerosene Lamps, Hand Forged Gransfors etc start around $50 and go into the 100s. North Star Commander Orders, Large Meeorite Samples etc start in the 100s and go into the 1000s.